September 26th, 2016 January 20th, 2017. 1. An Iowa Caucus Special Edition set of the ten 2016 Presidential Candidate subset cards were released on Topps online for a 24hr period on February 1st and 2nd of 2016. $29.99 for all ten cards, or $9.99 for each 2-card set; the number of cards/sets ordered equaled the number produced for that limited time. 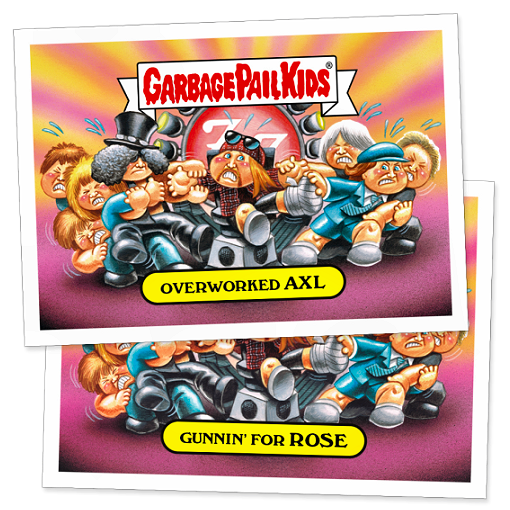 The set was modeled after the Classic GPK Patriot stickers set with the red-white-and-blue banner style logo and nameplate. The Presidentail canditates include: Hilary Clinton, Donald Trump, Jeb Bush, Bernie Sanders and Ben Carson. 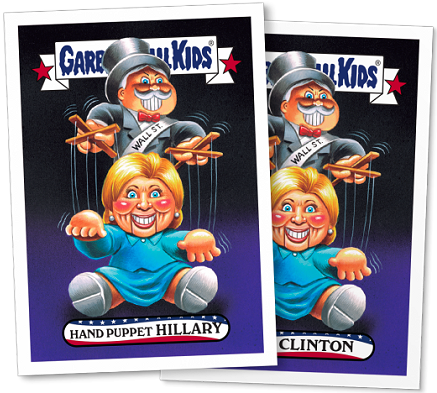 The Presidential cards use the darker blue GPK banner logo. 2. A New Hampshire Special Edition set of the eighteen 2016 Presidential Candidate subset cards were also released on Topps online for a 24hr period on February 9th and 10th of 2016. $49.99 for all eighteen cards, or $9.99 for each 2-card set; the number of cards/sets ordered equaled the number produced for that limited time. 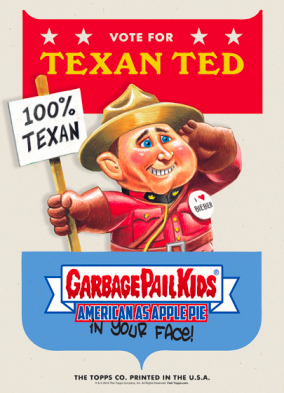 The set was modeled after the Classic GPK Patriot stickers set with the red-white-and-blue banner style logo and nameplate, but this time with all-new images not found in the Apple Pie (In Your Face!) set. The Presidentail canditates include: Hilary Clinton, Donald Trump, Jeb Bush, Bernie Sanders, Ben Carson, Ted Cruz, Marco Rubio, Chris Christie and John Kasich. Rand Paul dropped out of the race so the concept was never realized. Additional information within Art Gallery page. As of 02/28/2016, all eighteen characters were sold on Topps Online in the following formats: a regular 10x14" trading card stock poster for $19.99ea or a 1-of-1 Gold 10x14" poster for $99.99ea. 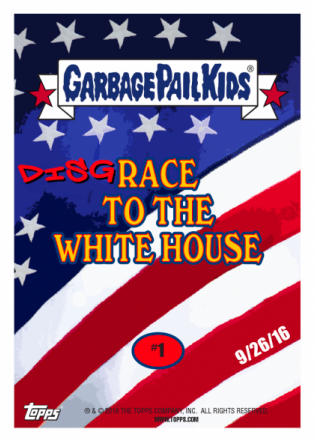 The Presidential cards use the darker blue GPK banner logo. 3. During the week of the New Hampshire Primary, the Topps online store posted several different Campaign Poster Set options for six of the characters from the Iowa and New Hampshire Caucuses -- along with a non-campaign poster collection of all 10 characters from the 2016 Presidential Canditates subset sold separately for $19.99; cards 1a of 5 through 5b of 5 images found on 10x14" trading card stock. The following six characters: DONALD Dump, Texan TED, Billary HILLARY, Batty BERNIE, Beat BUSH and Repo'ed RUBIO were sold in four different formats: a regular 10x14" trading card stock poster for $19.99ea, a 1-of-1 Gold 10x14" poster for $99.99ea (all six sold-out immediately), a 1-of-199 campaign set of all six characters on 5x7 trading card stock for $14.99ea and a 1-of-49 campaign Gold set on 5x7 card for $29.99ea. 4. 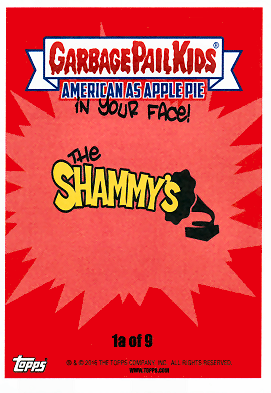 A third Topps online exclusive set, The Shammys -- a slam on the Grammys, went on sale for a 24hr period on February 15th and 16th of 2016. $49.99 for all eighteen cards or $9.99 for each 2-card set; the number of cards/sets ordered equaled the number produced for that limited time. The nominees were painted by David Gross, Joe Simko and Brent Engstorm for the following personalities: Sia Furler, Kendrick Lamar, Lady Gaga, Kanye West, Pink (Alicia), Adam Levine, Nicki Minaj, Justin Bieber and Glenn Frey. As of 02/28/2016, all eighteen characters were sold on Topps Online in the following formats: a regular 10x14" trading card stock poster for $19.99ea or a 1-of-1 Gold 10x14" poster for $99.99ea. 5. The original Pencil Artwork concept by Brent Engstrom for the Shammys online subset, for cards 4a of 9 Loony LADY and 4b of 9 Goofy GAGA, had a much more OS3 113b Liberty LIBBY feel with the character covered in trash -- including a banana peel on top of her head; plus a dead cat, skull, used tire, bottle, can, apple core, bone, et cetera. The final image ended up being a combination of her eccentric outfits from previous award shows instead. 6. 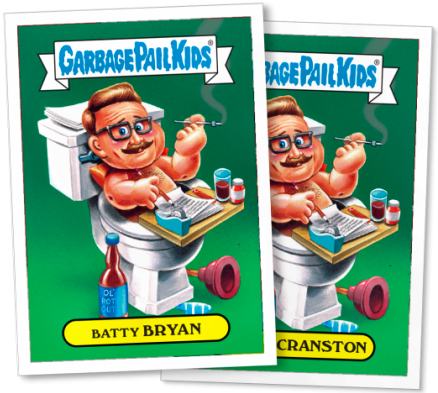 A fourth Topps online exclusive set, The Not-Scars -- an Oscars parody, went on sale for a 24hr period on February 28th and 29th of 2016. $49.99 for all eighteen cards or $9.99 for each 2-card set; the number of cards/sets ordered equaled the number produced for that limited time. The nominees were painted by Brent Engstrom, Joe Simko, Mark Pingitore, David Gross and JungHwa Im for the following personalities: Matt Damon, Leonardo DiCaprio, Michael Fassbender, Bryan Cranston, Jennifer Lawrence, Kate Winslet, Chris Rock, Tom Hardy and Christian Bale. As of 03/15/2016, all eighteen characters were sold on Topps Online in the following formats: a regular 10x14" trading card stock poster for $19.99ea or a 1-of-1 Gold 10x14" poster for $99.99ea. 7. A fifth Topps online exclusive set, the Presidential Super Tuesday cards went on sale for a 24hr period on March 1st and 2nd of 2016. $29.99 for all ten cards or $9.99 for each 2-card set; the number of cards/sets ordered equaled the number produced for that limited time. 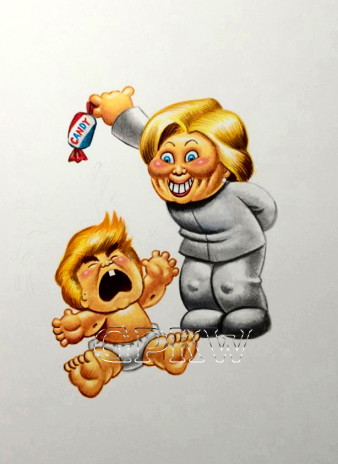 The images were painted by Brent Engstrom, Joe Simko, Mark Pingitore and JungHwa Im for the following personalities: Donald Trump, Ted Cruz, Marco Rubio, Hillary Clinton and Bernie Sanders. 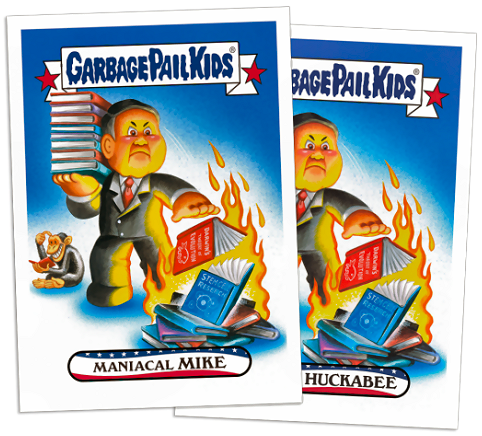 The set was modeled after the Classic GPK Patriot stickers set with the red-white-and-blue banner style logo and nameplate. 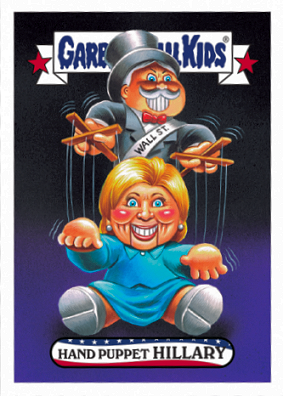 The Presidential cards use the darker blue GPK banner logo. As of 03/15/2016, all ten characters were sold on Topps Online in the following formats: a regular 10x14" trading card stock poster for $19.99ea or a 1-of-1 Gold 10x14" poster for $99.99ea. 8. A sixth Topps online exclusive set, the Presidential Mega Tuesday cards went on sale for a 48hr period on March 15th through the 17th of 2016. $39.99 for all sixteen cards or $7.49 for each 2-card set; the number of cards/sets ordered equaled the number produced for that limited time. 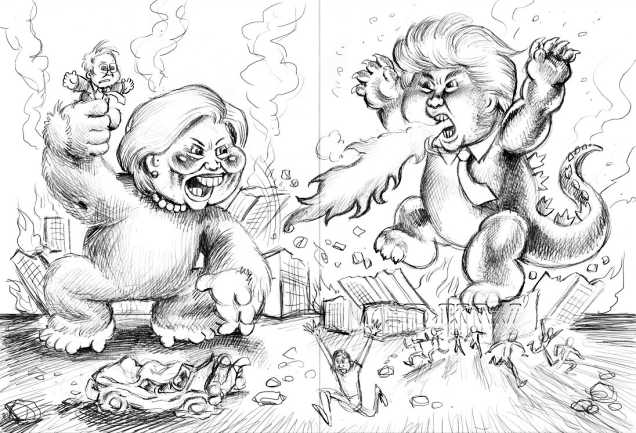 The images were painted by Brent Engstrom and JungHwa Im for the following personalities: Donald Trump, Ted Cruz, Hillary Clinton and Bernie Sanders; two characters for each personality. 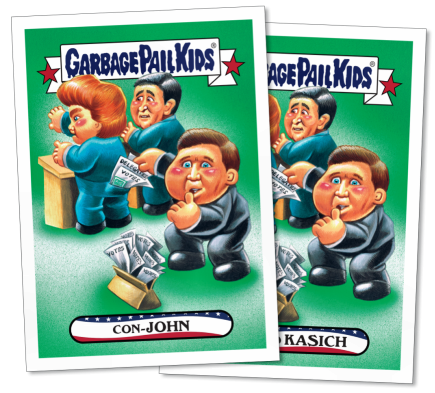 The set was modeled after the Classic GPK Patriot stickers set with the red-white-and-blue banner style logo and nameplate; the cards use the darker blue GPK banner logo. As of 03/2016, all sixteen characters were sold on Topps Online in the following formats: a regular 10x14" trading card stock poster for $19.99ea or a 1-of-1 Gold 10x14" poster for $99.99ea. 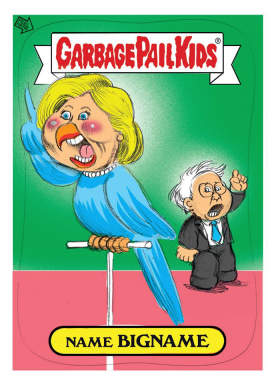 The original Color Concept by Brent Engstrom for the Mega Tuesday online set, for cards 6a of 8 Replica RODHAM CLINTON and 6b of 8 Copycat CLINTON had the ex-First Lady purched on a birdstand, with no podiums. 9. A seventh Topps online exclusive set, the Rock & Roll Hall Of Shame and Hall of Lame cards went on sale for almost a month, from April 8th until the HBO special that aired on April 30th, 2016. $49.99 for all twenty cards or $9.99 for each 2-card set; the number of cards/sets ordered equaled the number produced for that limited time. The images were painted by Brent Engstrom, David Gross and JungHwa Im for the following personalities: Hall of Shame characters; Eazy-E, Dr. Dre, Ice Cube, the Deep Purple rock band and the Chicago rock band (Robert Lamm), Hall of Lame characters; the Cheap Trick rock band (Bun E. Carlos), the Steve Miller (rock) Band, Kendrick Lamar (with David Crosby, U2's Bono and Bruce Springsteen), Kid Rock and The Black Keys (Dan Auerbach and Patrick Carney) with The White Stripes; two cards for each music personality. 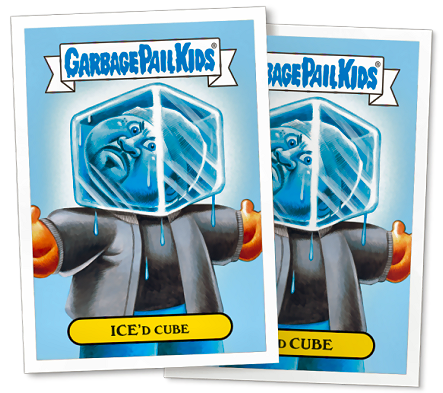 The blue background for cards 3a ICE'd Cube and 3b Cold CUBE were lightened by Topps. As of 04/2016, all twenty characters were sold on Topps Online in the following formats: a regular 10x14" trading card stock poster for $19.99ea or a 1-of-1 Gold 10x14" poster for $99.99ea. 10. An eighth Topps online exclusive set, the Presidential April Primaries cards went on sale for a 48hr period on April 26th through the 28th of 2016. $29.99 for all ten cards or $9.99 for each 2-card set; the number of cards/sets ordered equaled the number produced for that limited time. 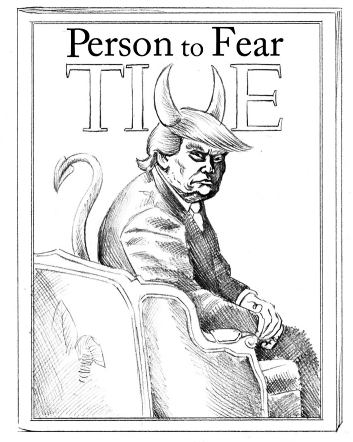 The images were painted by Brent Engstrom and JungHwa Im for the following personalities: Donald Trump, Ted Cruz, John Kasich, Hillary Clinton and Bernie Sanders; two characters for each personality. 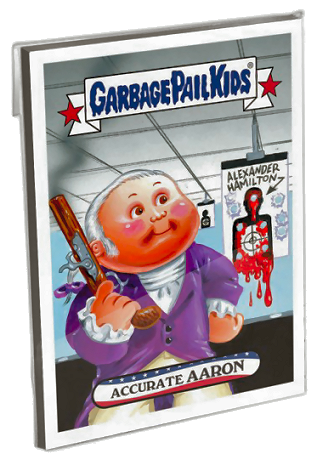 The set was modeled after the Classic GPK Patriot stickers set with the red-white-and-blue banner style logo and nameplate. 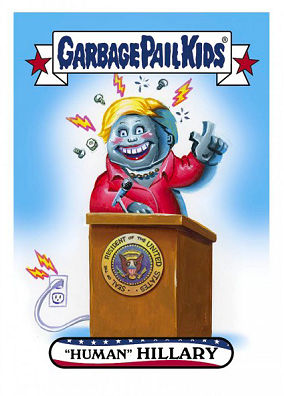 The Presidential cards use the darker blue GPK banner logo. As of 04/2016, all ten characters were sold on Topps Online in the following formats: a regular 10x14" trading card stock poster for $19.99ea or a 1-of-1 Gold 10x14" poster for $99.99ea. 12. A tenth Topps online exclusive set, the Presidential 4th Of July Founding Fathers cards went on sale for a 5-day period on June 29th through July 5th of 2016. $24.99 for all eight cards or $9.99 for each 2-card set; the number of cards/sets ordered equaled the number produced for that limited time. The images were painted by Brent Engstrom and Joe Simko for the following personalities: Aaron Burr, George Washington, Alexander Hamilton plus Andrew Jackson and Jefferson Thomas. 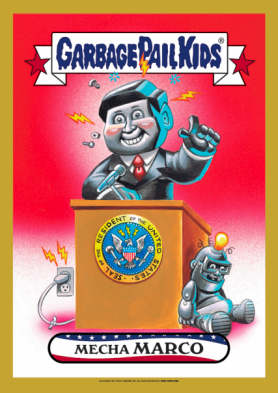 The set was modeled after the Classic GPK Patriot stickers set with the red-white-and-blue banner style logo and nameplate; the cards use the darker blue GPK banner logo. Artist Brent Engstrom's signature can be located in both of the characters he painted. The original concept of the 4th of July cards for the characters of 4a Jobless JEFFERSON and 4b Terminated THOMAS had Alexander Hamilton getting kicked off of the 10 dollar bill by Harriet Tubman. 13. 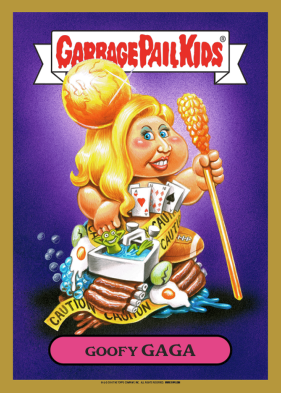 An eleventh Topps online exclusive set, the Presidential Republican National Convention cards went on sale for a 7-day period on July 18th through July 25th of 2016. $29.99 for all ten cards or $9.99 for each 2-card set; the number of cards/sets ordered equaled the number produced for that limited time. The images were painted by Brent Engstrom and JungHwa Im for the following personalities: Donald Trump, Chris Christie, Ted Cruz, Paul Ryan and Clint Eastwood. 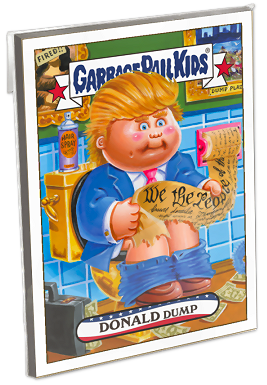 The set was modeled after the Classic GPK Patriot stickers set with the red-white-and-blue banner style logo and nameplate; the cards use the darker blue GPK banner logo. 14. 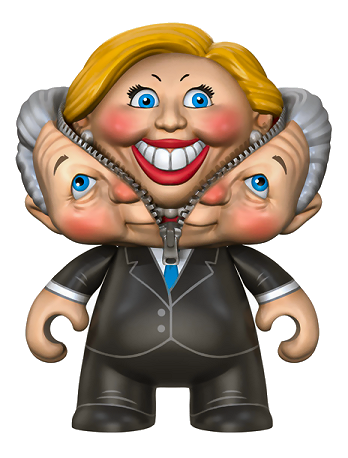 A twelfth Topps online exclusive set, the Presidential Democratic National Convention cards went on sale for a 7-day period on July 25th through August 1st of 2016. $29.99 for all ten cards or $9.99 for each 2-card set; the number of cards/sets ordered equaled the number produced for that limited time period. The images were painted by Brent Engstrom and JungHwa Im for the following personalities: Hillary Clinton, Bill Clinton/Lynch, President Barack Obama, Bernie Sanders and Elizabeth Warren. 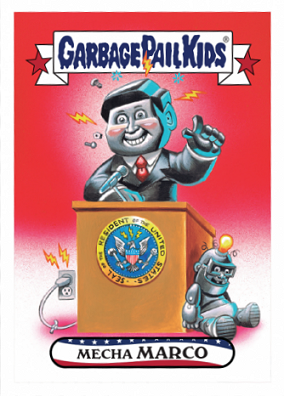 The set was modeled after the Classic GPK Patriot stickers set with the red-white-and-blue banner style logo and nameplate; the cards use the darker blue GPK banner logo. 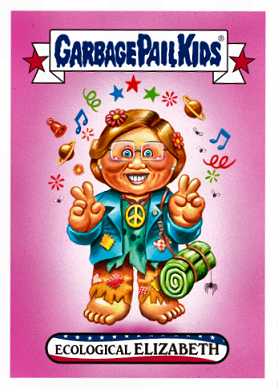 Engstrom pays tribute to Tom Bunk's OS3 character 91a BLAKE Flake and 91b Hippie SKIPPY for the Democratic National Convention card #5. 15. 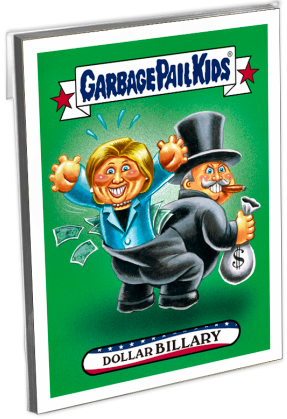 An exclusive, Giant 10-card set of the 'Best of' Presidential Candidates for Clinton and Trump was released at the San Diego Comic Con in July of 2016 at the Atomic Toybox Entertainment, Inc. booth for $20. The set is an enlarged replica of the exclusive cards taken from various Presidential Candidates set sold by Topps online throughout early 2016 that acts as a publicity parody for the upcoming Presidential Election. The various sets include 2016 Presidential Candidates (Iowa Caucus Special Edition), New Hampshire Caucus, Presidential Super Tuesday, Presidential Mega Tuesday and the Presidential April Primaries. 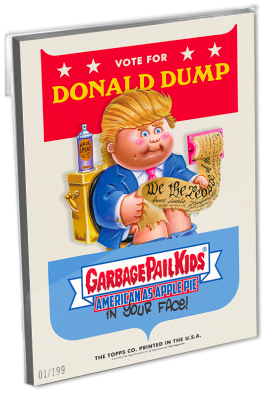 The original DONALD Dump character stems from the 2004 All-New Series 3 release and painted by artist Tom Bunk. 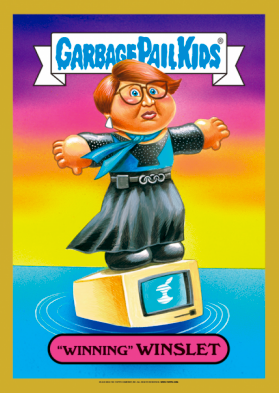 At the time, Topps still had the artists make the characters look like the new style of GPK, however, in 2012 for the Brand-New Series releases, they were allowed to make them in the CPK-likeness again. Booth 3921. 16. 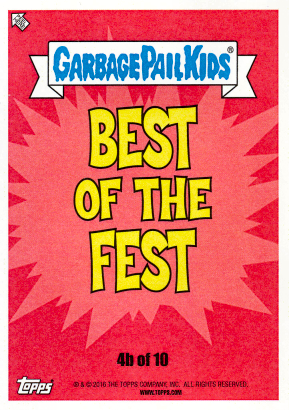 A thirteenth Topps online exclusive set, the Best of the FestRiot Fest-inspired music cards went on sale for a 7-day period on August 29th through September 5th of 2016. $49.99 for all twenty cards or $9.99 for each 2-card individual set; the number of cards/sets ordered equaled the number produced for that limited time period. The images were painted by Joe Simko, Brent Engstrom and David Gross for the following personalities: Arcade Fire's William Butler, Beck (Hansen), the Dead & Company [Bob Weir -- a founding member of the Grateful Dead and John Mayer], Axl Rose (in a foot cast from his April 2016 injury sitting on the Foo Fighters throne, usually performing on a chair, getting pulled by the members of Guns N' Roses and AC/DC), Radiohead's Thom Yorke, the Red Hot Chili Peppers' Flea and Anthony Kiedis, The Roots' Ahmir "Questlove" Thompson, The Cure's Robert Smith, Death Cab for Cutie's Benjamin Gibbard  who had an item thrown at him from an audience member, and Morrissey, lead singer of The Smiths, who stated he saw "no difference between eating animals and paedophilia". 17. 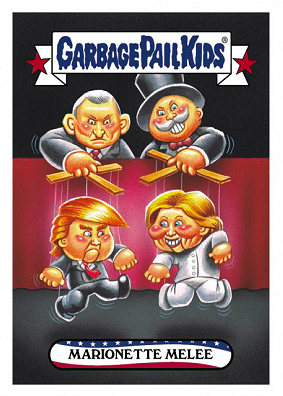 Several GPK 'On-Demand' exlusive cards and sets were released by Topps online from late September through January that surrounded the 2016 Presidential Election with the Disg-Race to the Whitehouse series title and sold for a 24 hour period only. 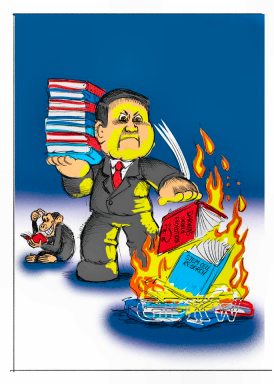 The Debate-inspired caricature sticker cost $9.99 for one card or came in quantities: $29.99 for five cards, $49.99 for ten cards and $79.99 for twenty cards  the number of cards ordered equaled the print run number for that limited time period. 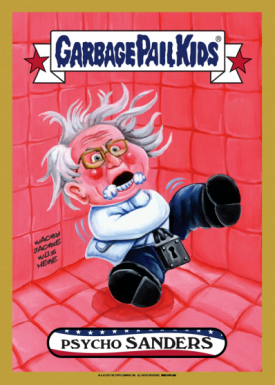 Topps requested that the first image painted for the first release, by Brent Engstrom (with a special appearance by Bernie Sanders), be painted 3x the normal size of usual card image. Due to the short nature of these sales, Topps sent out email notifications to solicit sales, ran website ads and and hit up social media in the form of Facebook and Twitter. For the second release, the online sale was supposed to take place from Sept 27th through Sept 28th, but due to an image being rejected another character had to be created, so the sale was pushed back by one day. Several images, starting with the third release, were painted in just under 4 hours the same day by the artists, a roughly 12 hours overnight, or over a weekend to meet Topps' requested deadline... this 'rushed' artwork is apparent in some pieces and more time was given for later releases. Interesting to note that within the description online card #49 was titled 'White-Clothed Clinton' instead of 'Colorless Clinton', card #63 was titled 'KellyAnne Accomplice' instead of 'KellyAnne Con Job' and card #124 '"Throned Trump' was titled 'Undignified Donald' within the bundle page. The card for painting #82, plus others, depicts a Wacky Packages-inspired image; see the 'Comprehensive Checklist' at the bottom of the page for other Wacky Package (WP) card numbers and artist information. 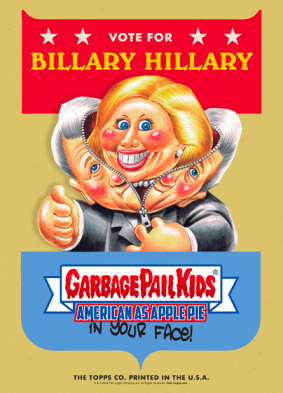 'Disgrace' release number #32 on January 3rd, 2017 within the new year not only containted another Wacky image, but a new subset titled "GPK: Network Spews", a parody of 'current events' in the news -- this online 'subset' will be housed on the 'Prime Slime Trashy TV' pages. 18. 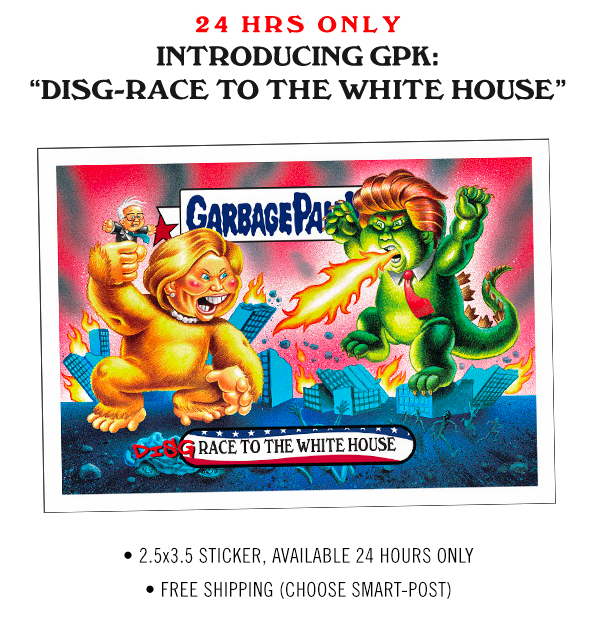 The first Presidential Debate-inspired caricature for Topps' first On-Demand product for GPK was titled 'Disg-Race to the Whitehouse' for card #1. The original idea was conceptualized during the 2017S1 ADAM-Geddon concept stage and pulled from that set for the exclusive Presidential online releases in the laste summer of 2016. 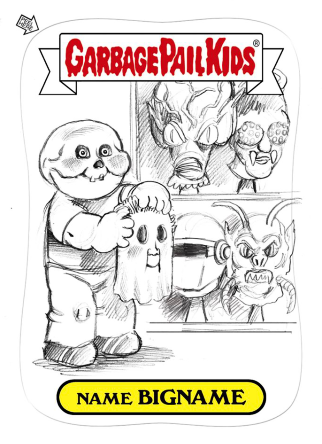 The original ideas by artist Brent Engstrom had the characters as separate caricatures intended for their own two cards; however, Topps wanted the characters to be on the same concept and they requested Brent to paint the image 3x the normal size of a normal card image, although it was printed on a regular 2.5x3.5 card size. 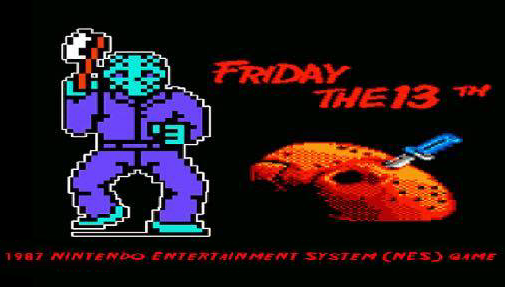 The image would be great on a 5x7 card, used as a puzzle or a poster-type release. 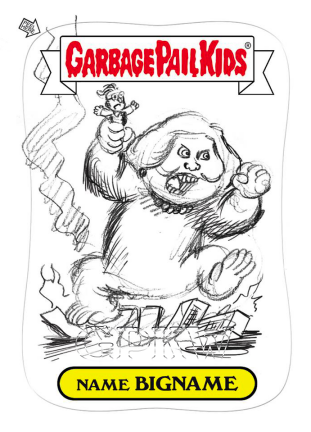 Topps had Engstrom do a baby version of the 'Rampage'-like concept for card #12 that centered around the Vice-Presidential Debate in early October; with toy blocks for the collapsing city and prepubescent smoke puffs. During the later phase of the online Presidential releases, there were a couple of Repeated Concepts from the previos 'Super Tuesday' set and the newer 'Dis-Grace to the Whitehouse' set. Card #24 Marionette Melee and cards 4a Hand Puppet Hillary and 4b Crony Clinton (Super Tuesday), both by artist Brent Engstrom, along with card #31 "Human" Hilary painted by artist Joe Simko and cards 3a Mecha Marco and 3b Robotic Rubio (Super Tuesday) painted by Brent Engstrom; both concepts by Engstrom. Also pictured, card #32 Toddler Trump before the background and tears were added; the only painting Engtrom has performed backwards -- painting the subject prior to the background in case there were any changes from Topps. 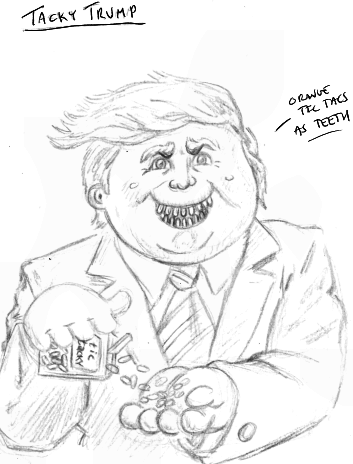 Also pictured is an unpublished DisGrace concept by artist David Gross where Trump's teeth have been replaced with orange Tic Tacs. 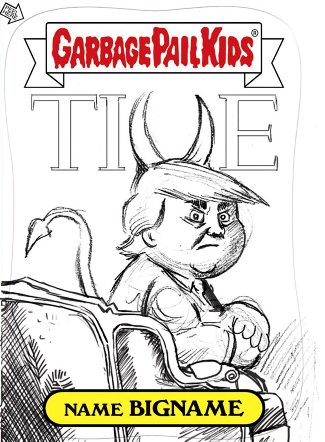 Artist Brent Engstrom submitted the sketch for card #102 TRUMP TIME, found within the 'Disgrace to the White House' exclusive online subset, as a GPK concept -- based off of the recent TIME magazine cover. At the time, Topps had been adding a Wacky Package image to the online mini sets including two of the holiday-themed sets. 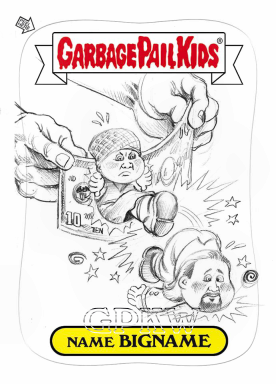 Topps requested that Engstrom resubmit the concept as a Wacky Package sketch, but in the end decided on using the Garbage Pail Kids concept. 19. 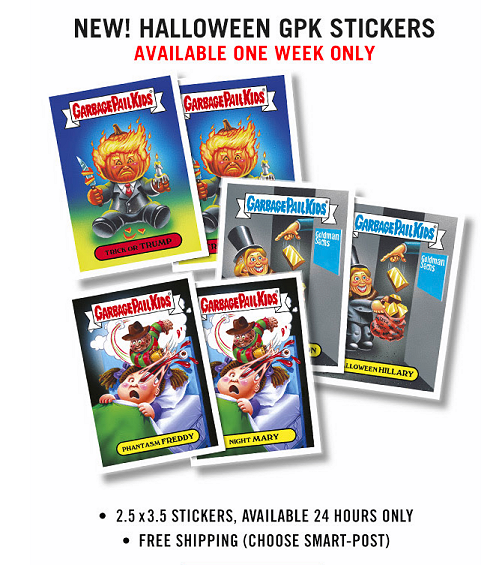 An exclusive seasonal subset, the GPK Halloween sticker set, went on sale for a 7-day period on October 25th through November 1st of 2016. It was a very refreshing release after so many Presidential online sets that were sold on Topps online. The bundle of 18 cards, 9 new images with twins, sold for $39.99 or $9.99 for each 2-card set; the number of cards/sets ordered equaled the number produced for that limited time period. Six images were painted by artist Brent Engstrom, one image was painted by artist Joe Simko and one image was painted by Fred Wheaton. The Presidential personalities of Hillary Clinton and Donald Trump do make-up two of the images within the subset. 20. 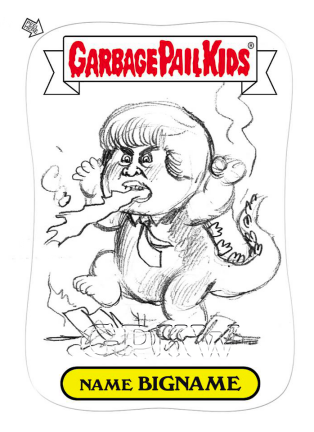 The exclusive online Halloween subset was a nice suprise during the extremely heavy release of Presidentail debate stickers by the Topps company during the debate season. 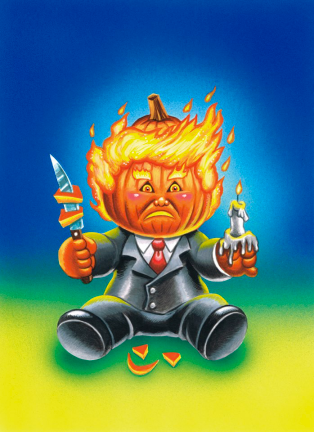 The first two Presidential candidate cards poking fun at Donald Trump and Hillary Clinton were added to the All Hallows' Eve-themed subset late in production; cards 1a/b by artist Brent Engstrom is a tribute to John Pound's OS4 image for cards 153a JACK O. Lantern and 153b DUNCAN Pumpkin. 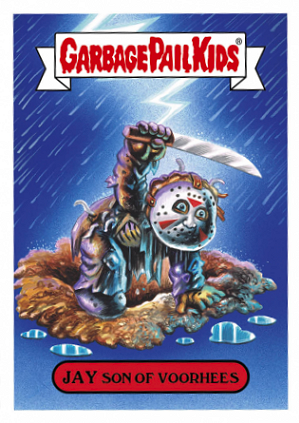 The Jason Voorhees parody of cards 3a/b, also by artists Brent Engstrom, is a homage to John Pound's OS1 character for cards 5a Dead TED and 5b JAY Decay; it was created during the Riot Fest period of online releases and the color scheme is based off of the 'Friday The 13th' video game for the 1987 Nintendo Entertainment System (pictured below) -- the image was the first painting by Engstrom that he completed "for the fun of it" and was later submitted to and purchsed by Topps. 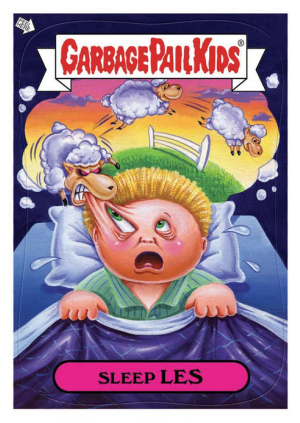 Cards 4a/b, nightmare Kid, by artist Joe Simko is a subconscious nod to his Brand New-Series 2 image for cards 64a Sleep LES and 64b Insomniac ZACK (pictured below). 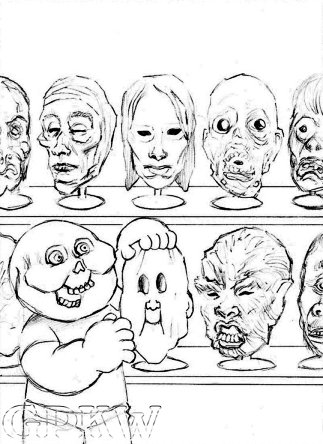 Engstrom's image for cards 5a/b, scream Kid, is based off of Edvard Munch's The Scream painting -- along with cards 3a/b, Jason Kid, were both considered for a NYCC exclusive release but held back for the planned Halloween set. 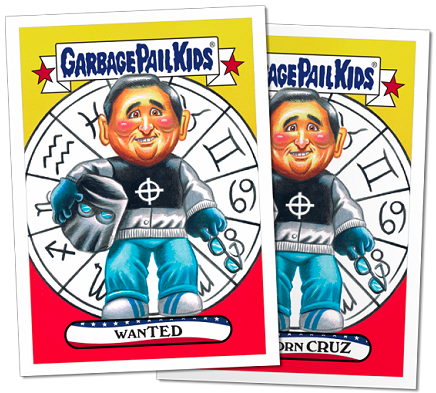 The image for cards 6a/b, vampire Kid, created by artist Fred Wheaton was intended for the upcoming ADAM-Geddon set, along with card 7a/b, bobbing Kid, painted by Engstrom, but were both removed since they didn't correlate with the overall theme -- collectors have not seen GPK card front artwork by Wheaton since the All-New Series 6 release for cards 38a I-Clod TODD and 38b MP TREY (final color concept pictured below). The painting for cards 8a/b, masked Kid, was completed by Engstrom for the "Art of the Halloween Mask" exhibit that took place in Los Angles from Oct 15th through Nov 15th of 2016; Brent's brother does work with latex masks and was the connection for the project -- the masks within the painting are based off of the Topstone 'Hallween Masks' catalog (pictured below). 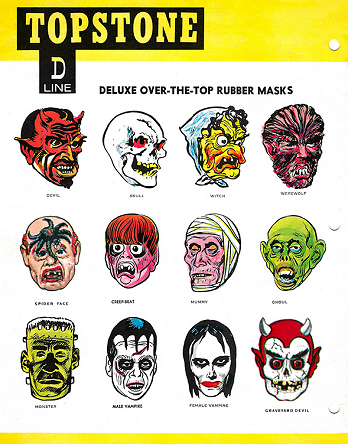 The original concept was created for the Prime Slime Trashy TV release for the Face-Off show on Syfy but not picked for the 'Reality TV' subset; it was later purchased by Topps to include with the Hallowe'en set. 21. 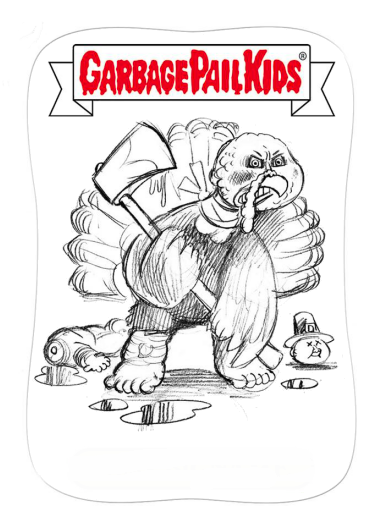 A seasonal subset, the GPK Thanksgiving sticker set, went on sale for a 7-day period on November 21st through November 28th of 2016; sold excusively via Topps online. The bundle of 11 cards, 5 new GPK characters with twins and 1 Wacky Packages product item, sold for $29.99 or $9.99 for each mini set; the number of cards/sets ordered equaled the number produced for that limited time period. Three images were painted by artist Brent Engstrom, two images were painted by artist Joe Simko and one image was painted by David Gross. 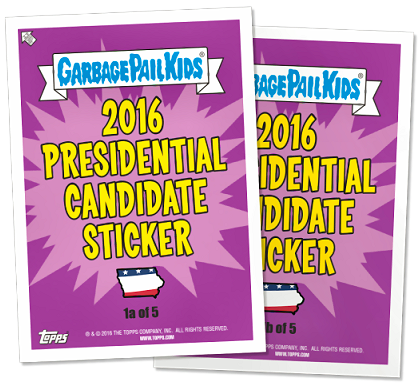 The Presidential personality of Donald Trump does make an appearance in the first sticker image of the subset. The name for card 3a Food Fight EARL was also used with a hyphen for a 2016S2 Prime Slime Trashy TV character within the Food Television subset for card 8b Food Fight- EARL. 22. 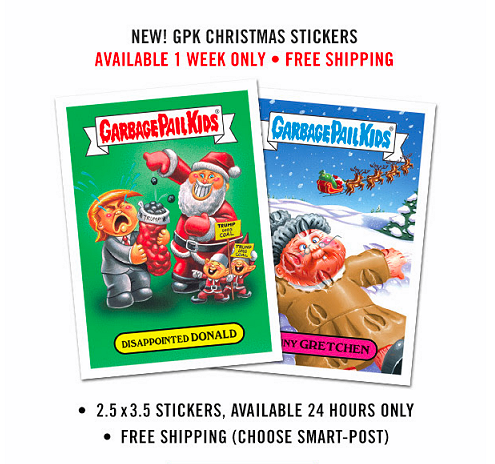 A seasonal subset, the GPK Christmas sticker set, went on sale for a 7-day period on December 20th through December 27th of 2016; sold excusively via Topps online. 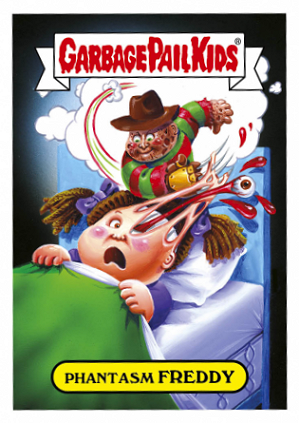 The bundle of 13 cards consisted of six new GPK characters with twins and 1 Wacky Packages product item that sold for $34.99 or $9.99 for each mini set; the number of cards/sets ordered equaled the number produced for that limited time period. Four images were painted by artist Brent Engstrom and three images were painted by artist Joe Simko. 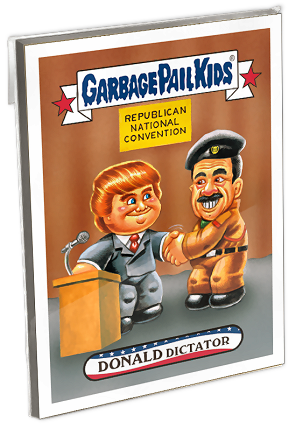 The Presidential personality of Donald Trump makes two appearances in both a GPK and Wacky Package card. 23. 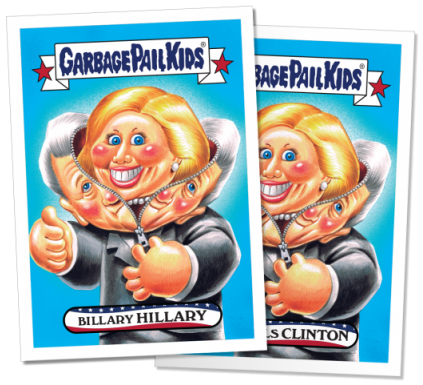 To help poke fun at the Presidential candidates in GPK format, the Topps Company further licensed its popular parody franchise to the Funko vinyl figure company. The two figures, to be released in June of 2016, are modeled after two of the 2016S1 New Hampshire primary characters sold exclusively online. 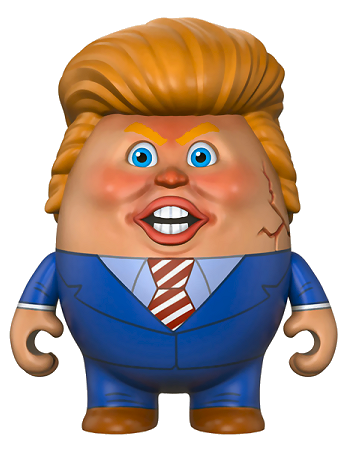 Item # 10507, DONALD Dumpty, was modeled after card 1a of 9 painted by artists Joe Simko and item # 10508, Billary HILLARY, was modeled after card 8a of 9 painted by artists Brent Engstrom. 24. Due to the nature of the Topps online exclusive sets poking fun at the Presidential Candidates and celebrities, a lot of the Nomenclature of the cards contain twin cards with last names instead of first names. The congested concepts often contain several characters so the card names are not always person-specific. The set also contains the first set of tongue-in-cheek quotaiton marks within the naming; Presidentatial Candidate card 2a "Texan" TED, The Shammys cards 2b "Ascending" ALICIA and 7b "Welcome" WEST and The Not-Scars card 6b "Winning" WINSLET.